More strange wading birds today. It’s been another slip fest here today and I am loving it. 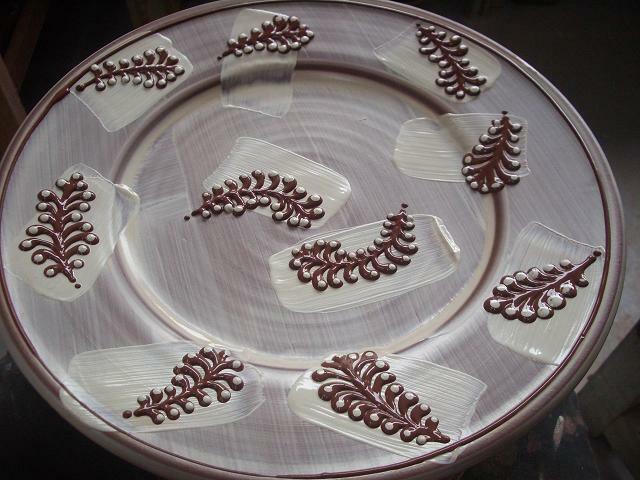 I really like this plate above, it’s thin white slip and thick white slip and then trailed slip too. Nice looking at this stage. My trouble is I don’t know when to stop. I am finally making some pots that I am excited about again and it is just a matter of days before I have to pack to go to Earth and Fire and I’m making pots that I want to take with me because they are new and exciting to me and so as a result I’ll probably do something stupid like blow them up by trying to fire them before they are dry. What I need is time, where can I get some of that? I have so many things that I want to explore and try and do but I never seem to be able to work myself a bundle of time in which to concentrate on doing just that. 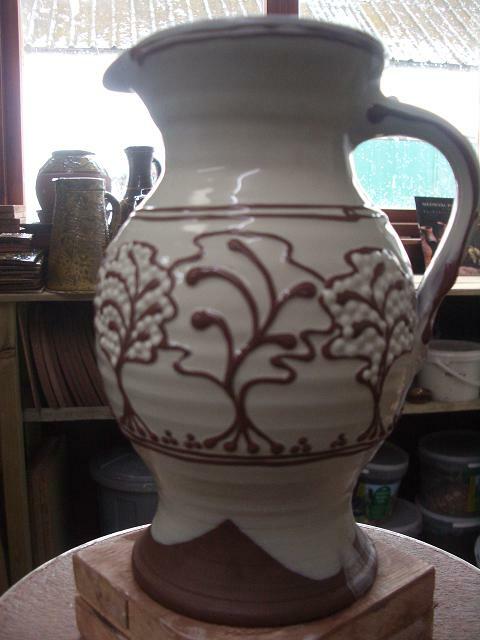 This jug below I loved the shape of, he is what the others should have been. However I liked him so much I couldn’t work out how to decorate him and ended up just having to do something fast and I fear I messed him up because of that. I was feeling too precious about him. So my news which I don’t think I have told you yet but forgive me if I have is that I am going back to America in November. Who would have thought it? Twice in one year. 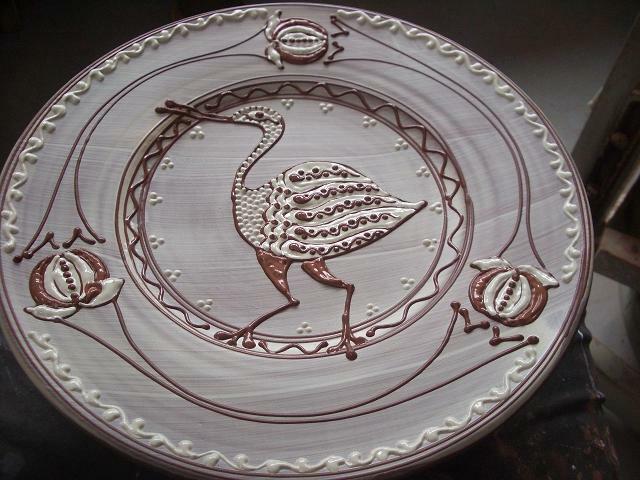 CraftScotland an organisation who support and promote Scottish craft have been offered space at the Philadelphia Museum of Art Craft Show, here is their news post about the show. Scotland is the guest country at the craft show this year and I have been offered a stand at it. So there you go, Hannah McAndrew does America twice within 6 months. How utterly crazy. How very exciting though, so come and visit if you can, it’d be wonderful to meet some more of you readers over the other side of the pond. I’ll have more news about that as it comes along I’m sure so stay tuned. In the mean time here’s the last of the pots for the day, unpacked a glaze kiln this afternoon and straight away filled it with dry pots to bisque. Time time time running away again. 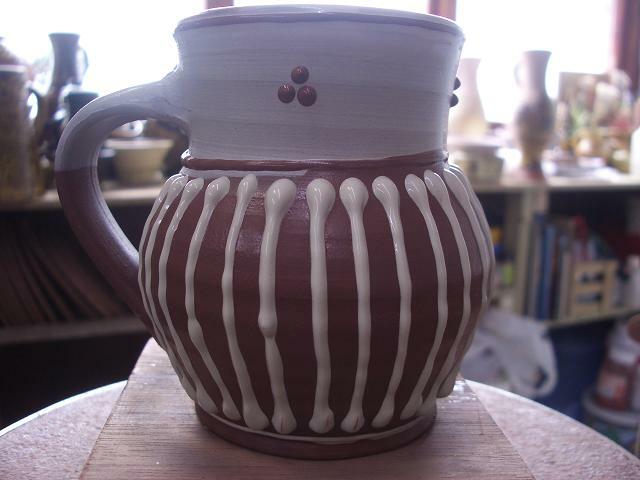 This entry was posted in baluster jugs, brushed slip, Earth and Fire, fresh slip, Humbug mugs, plates. Bookmark the permalink. Lovely to see fresh slip! 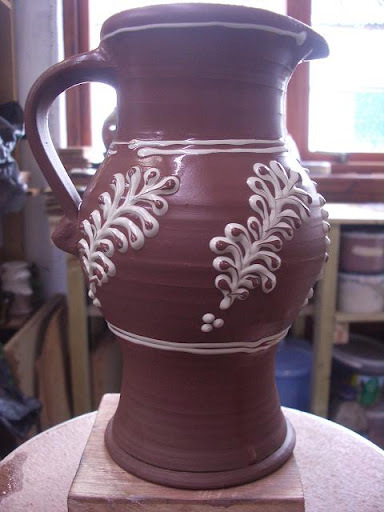 I sometimes wish I was still doing slipware!! Don't blow up your pots, Hannah. Yay! I'll definitely go to Philly to see your booth. Is it just for sales? Do you think you'll be doing a workshop while you're there? 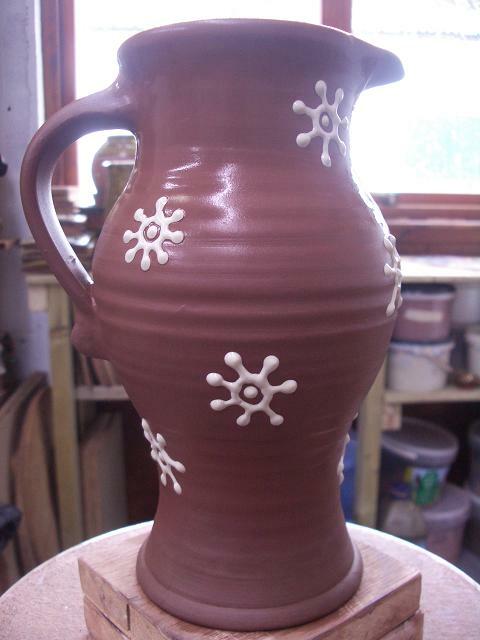 Please…do we get to see the glaze kiln results that you unpacked today, too? I would like to eat those designs right off the plate- they look so tasty- the USA will never be the same when you are gone again…:(! That is great news.Somehow with your decoration, there is a wide gap between "enough" and "too much".At the workshop, every time I thought you were done, you added more and it looked better. Pots look great H.! I love the one with the simple deco. Can't wait to see you in November. 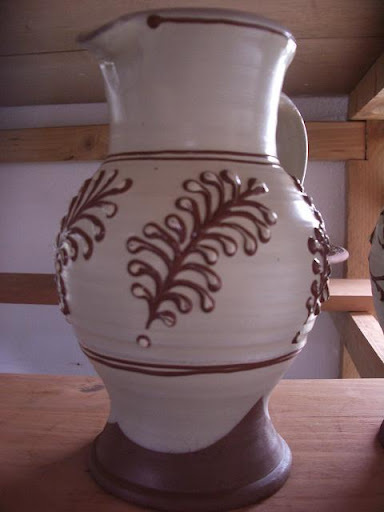 Great pots and great news! This is fantastic! !